Last minute wedding? No problem. Nick and Michelle contacted Intimate Weddings of Orlando with the desire to have their wedding in less than 3 weeks. Once Victoria heard what they were looking for she sprang into action and recommended a several venues she thought that would fit the couple. 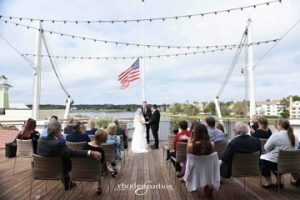 After check out the various packages, Michelle and Nick chose to be married on board Paddlefish, right in the heart of Walt Disney World at Disney Springs. Edmund Rhodes with Rhodes Studios Photography and Videography meet the couple early to take pictures around the Disney Springs area, before their guests arrival. He then stayed to photograph the ceremony, first dance, and family portraits. Flowers by Lesley rose to the challenge to make a stunning bouquet and boutonniere of white and lite pink roses. There was even a “hidden Mickey” in one of the blooms. my life. I can’t wait to spend the rest of my life with him by my side. We wish them a lifetime of love and happiness!